Learn why you hate your job. Hint: it has everything to do with your personality as an intuitive and introverted woman! Wow, this is officially the final dispatch of the Wellness Wednesday newsletter for 2017! And my, what a year it's been. Especially within the last couple weeks, things have been feeling really hectic. Babies about to be born, friends' loved ones passing away or leaving, anger on social media over the state of the country, hard conversations, new money goals, new fitness goals, lots o' learnin', and just generally a whooole lotta energy shifting around. Throw in the emotionally-laden holiday season, and it's no wonder people get overwhelmed during this time of year. We could all use a little more simplicity. This year, I'm simplifying my annual reflection and new year resolution-making by asking myself one simple question. But before I do, I want to acknowledge the fact that new year resolutions - which I think are better-called "new year intentions" - have a bad rap of not working! Because seriously, if you want to set a goal for yourself, start by figuring out what you'll do differently next week... not arbitrarily naming what you want 365 days from now! But more importantly, resolutions are often divorced from emotion. And without emotion, what's to propel you forward? We are humans after all, not robots. We operate on emotion at our core, not on batteries or algorithms. So let's keep our new year intentions simple and heartfelt this year. 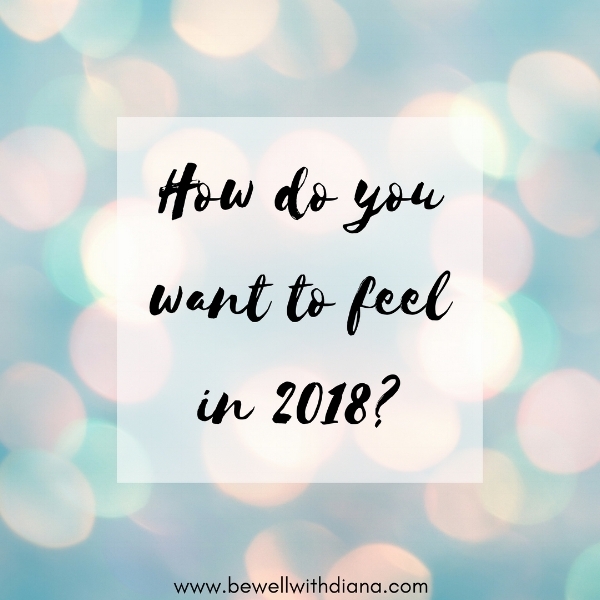 Ask yourself: How do I want to feel in 2018? This is your deeper "why" for any goals, decisions, or actions you may play with in 2018. This will be your motivation and measuring stick for success. Maybe start with just one, because again, simplicity! The purpose here isn't to force yourself to feel a certain way, but to take action to align yourself with the things, situations, or people that promote your desired feeling. As for me, I want to feel UNAPOLOGETIC in 2018. ...Unapologetic about the way I earn money, the people I surround myself with, my dorky personality, or even the way my apartment looks. I want to feel unapologetic about how I live my life and how my life looks. I've already starting asking myself this question every morning, and it's already spurred me into action - mostly in the realm of having difficult conversations that have been long-time-coming. It's also led me to reassess what type of companies I want to work with and even what types of rugs I have on my floor! I can't wait to see what's in store for both of us, just around the bend. Good intentions are nice, but you must be energized by what you do, otherwise you risk burning out before the job is done. If you are feeling more depleted than energized throughout the day, it's time to take an inventory of your work to make sure it's actually sustainable for you!